It seems that the only important news factors which may influence USDCHF are Switzerland’s KOF leading indicator data for April and Initial Jobless Claims number. This pair is acting neutral for now which is falling down the descendant channel and within the Andrews’ pitchfork. 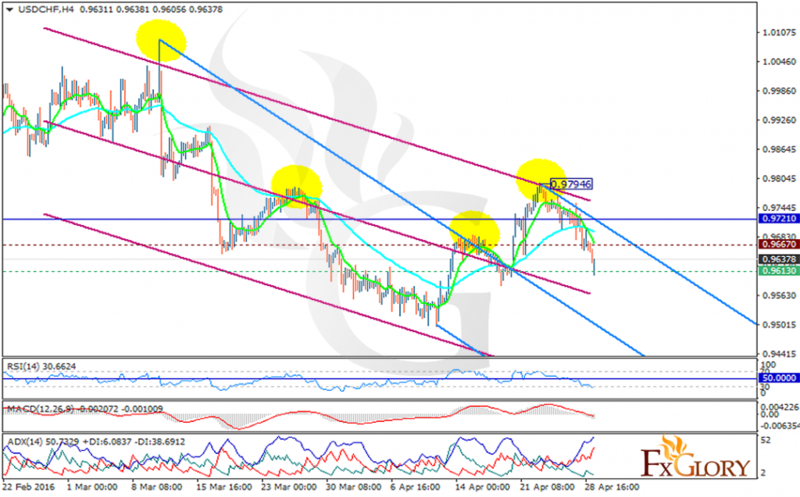 The support lies at 0.96130 with resistance at 0.96670 which both lines are below the weekly pivot point at 0.97210. All indicators are showing price decline such as MACD which is in negative territory; the RSI is below the 50 level and the ADX showing strong sellers than buyers. The EMA of 10 is crossing the EMA of 50 falling down which confirms the price rate reduction for the last recent days. Short positions are recommended with the target at 0.9580.